What's special about what we have done is we have avoided all these steps and sequenced the RNA directly. A team, led by scientists from the University of Dundee and the James Hutton Institute, have become the first researchers in the world to apply a new technique to sequence the genes of the plant Arabidopsis. The technique has the potential to allow scientists to breed new crop varieties in the future. The researchers, funded by the Biotechnology and Biological Sciences Research Council (BBSRC), are the first to try to understand how plant genes are organised by directly sequencing a molecule called RNA rather than DNA. This approach, which allows researchers to see exactly where a plant's genes end, could be applied to crops in the hope of boosting efforts to breed new varieties. The findings are published in the latest edition of the journal Nature Structural & Molecular Biology. The research involved collaboration between a team of biologists led by Dr Gordon Simpson of the University and the James Hutton Institute, computational scientists led by Professor Geoff Barton at Dundee, and a technology group from Helicos Biosciences in the USA. Dr Simpson explained: "Many genes work by coding for proteins, but the path from DNA to protein goes via an intermediate molecule called RNA. By sequencing the RNA you can see exactly which bits of the genome make proteins and what genes are turned on in different cells and at particular times. "Until now, people have sequenced RNA by first converting it back into DNA. They chop it up, add on special molecules and then because there is not enough, they copy the bits again and again, before finally sequencing. The trouble is that all these steps introduce bias and error. What's special about what we have done is we have avoided all these steps and sequenced the RNA directly." This technique allows scientists to see exactly where genes end with unprecedented certainty. This is important for two reasons. Firstly it helps find individual genes within genomes and so work out what they do. Second, it reveals something about the behaviour of cells. Cells can choose where a gene should end depending on what the gene should be doing. 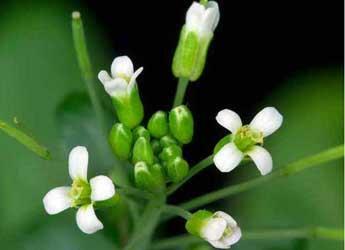 For example cutting off genes at different points affects when a plant flowers. It has recently become apparent that these choices occur widely in biology: for example, there are global changes in where genes end in cancer tissue. Dr Simpson continued: "Using this technique we can unequivocally score where genes end, count how active genes are and say from which strand of the DNA double helix the RNA is copied. Surprisingly we found that genes that overlap each other account for a large fraction of gene activity. We also found new ends to thousands of genes and found genes that were completely new to us." Professor Douglas Kell, Chief Executive, BBSRC, said: "This is a great example of how mastering new techniques and embracing new ways of working can deliver valuable insights into biology. It will be interesting to see where this team directs their expertise next."